Help, I hope someone can help. 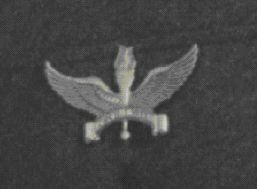 I am trying to locate someplace that I can replace the instructor pin that my dad had on his uniform. I am creating a shadow box and want to include it. All I have is a picture to show me what it looks like. I have gone to a local Army surplus store with no luck. If anyone can help please let me know and I can send you a copy of the picture. You can mail me the picture, and I'll put it online here if you want to? Thanks for the info, but I already checked the link for the medals and they don't have what I'm looking for. I will try to send the pic. What does the inscription say? Unfortunately I don't know. All I do know is that my dad was an instructor for aircraft mechanics. Looks like the Air Force Training and Education Command Crest. But I could be wrong. These folks seem to have the Air Force pins market. They have a toll free phone number and an email contact. Perhaps if you send a picture of that pin to them they can help you out. Thanks for posting it. I just received word from my mom that she has found the acutal pin that was on my dad's uniform. Thank you to all of you who had input on this subject.